Finchingfield is a village in Essex that is 8 miles North of Great Dunmow. It's a common tourist coach destination because it is generally regarded as being very "pretty". In fact it has won competitions for that in the past. 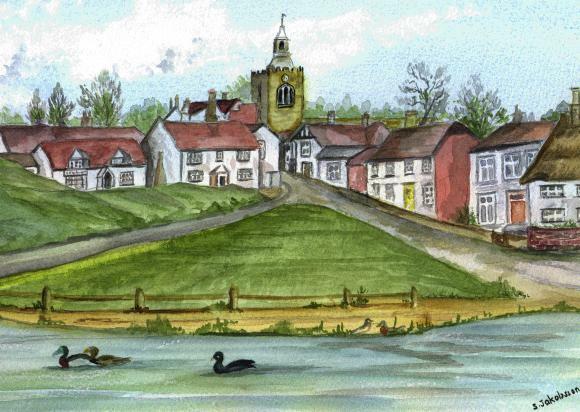 Views of the well known green, pond, cottages and church are often to be found on calendars, chocolate boxes, tea towels, postcards, jigsaws and the like. It has been described as "the most photographed village in England". One thing I did emphasise to her was how good our parish magazine, "The Villager", was as a source of community information but she forgot to mention that - so I will (in fact I think I just did!). Visitors can usually buy a copy at the Post Office. Anyone from Finchingfield may know me as the guy who flies radio controlled models over the local sports field. Well recently I've attached a small, lightweight digital camera to one of my models and have taken some aerial photos of the village. So far it's just around the playing field but as confidence grows I'll add more aerial shots over other parts of the village. Anyway, if you are interested, have a look at these pictures. 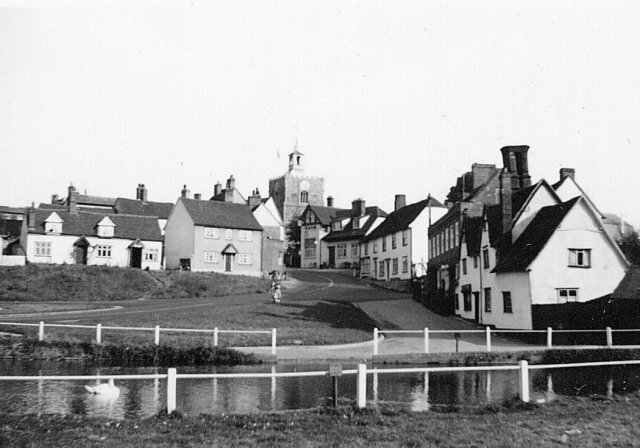 The picture below is a classic view of the village looking up from the pond towards The Causeway. The picture is actually from Sheila Jakobsson's page which you can reach by clicking here. She has a great collection of watercolour views of many of Essex' finest bits (Yes! It does have some). Roy Wooley sent me this black and white photo of the village that his wife took in the '50's - hasn't changed that much has it? In the pictures the small cottage to the very left is the Finchingfield Tea Rooms that is run by Hugh and Christine where you can get cream teas and sticky buns. The church in the centre is St. John the Baptist, Church of England. As I'm interested in campanology (bell ringing to the uninitiated!) I happen to know that there are 8 bells with the tenor at about 15cwt. It's a nice ring but I'm more of a six bell, doubles, person myself (I have been known to ring a bit of Stedman). As you walk up to the church from the green you will pass under the arches of one of Finchingfield's oldest buildings - the Guildhall. This houses a library and small museum. Further up past the church one will find the village primary school. There are some details in the most recent Oftsed report to be found in an Adobe Acrobat document that is located here. Also in that direction you will find Finchingfield's third pub, The Three Tuns. It's opposite the entrance to the Freshwell Health Centre which is a great amenity for Finchingfield to have (in such a small village). Just below the church and to the right is a house that used to be the Finch Inn pub. This was one of four pubs in the village but now there are only three. Out of the remaining pubs, personally I'd go for the pub opposite (not quite visible in the picture) - that's the Red Lion, they do great meals and have listed in the Camra guide for many years as well as winning commendations from "open fire pubs". The "main" pub in the village is the Fox on the green. It is roughly where this picture must have been painted from. Next to the Fox there is a comprehensive antiques centre. There is a wide variety of stock and a lot of stuff at very reasonable prices (says the man who bought his refectory table there!). You can find contact details along with a number of other really good antiques centres in Essex here. On the other side of this is Jemima's tea rooms. One of the many tea rooms now avilable within the village. Looking at the picture again, if you keep going left past the Causeway tea rooms you will get to the windmill which is a pretty good example of the early "post mill" type of windmill and I understand the council intend to open it to the public on some Sunday afternoons during the Summer. My mum was good enough to point out that details and a picture of it can be found here. There's also a mention of it here too. Further up, past the windmill, as you go out of the village towards Steeple Bumpstead (great place name, eh?) you will see "Honey pot" cottage which has been immortalised in the Lilliput lane series of porcelain figures. As far as I can gather "Honey Pot" cottage was one of their range in 1996 and may not still be available. 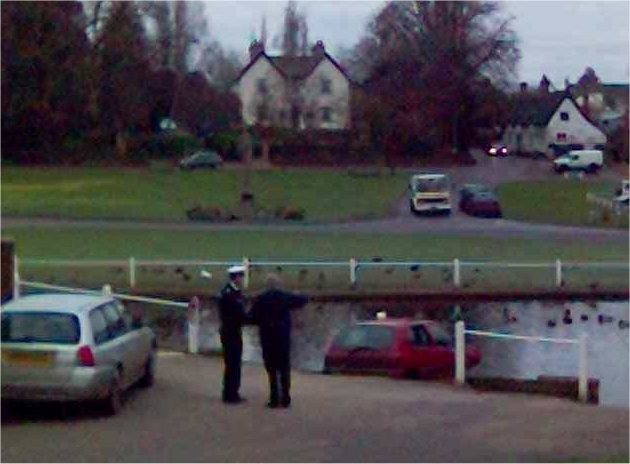 Finchingfield falls within the remit of Braintree District Council and the council has pages to be found here. Where you can learn interesting facts such as the estimated population of Finchingfield is about 1,249 living in about 488 dwellings. (Rather sadly they seem to have removed some details and pictures that they used to have of Finchingfield on their site before it became an "official" .gov.uk site). Details of the 417 bus service that goes to Finchingfield can be found here. You'd be amazed how many ex-USAF people I get emails from about Finchingfield. In fact I think that with only one exception, ALL the email I get about this Finchingfield page are from (ex-)members of the USAF! I moved to Finchingfield in 1990 and at that time the US air base was just being wound down to complete closure as a result of the ending of the cold war, Berlin wall, etc. For a couple of years the base sat almost completely deserted but then the UK's own Ministry of Defence police moved in and it has now become the UK's major base for National Police Training Centre training not only Ministry of Defence Police Officers but also many Home Office Department Police Officers. There are no more aircraft movements (which is a shame as I am a private pilot and would love to see the fast jets and transports) but some weekends there is a bit of glider activity from the base. (However traffic at nearby Stansted has increased dramatically which sort of makes up for the lack of planes). Talking of the airbase at Wethersfield. I'm more than happy to include this link to a site set up by Roger Barret that covers RAF Wethersfield. There's a lot of interesting photos to be found there. 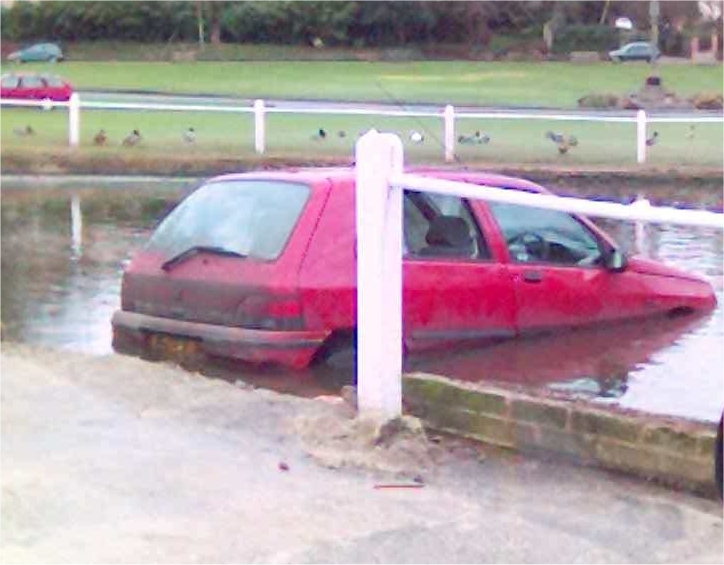 Just one final note: Please try and park sensibly and drive safely if you visit the village. If you'd like to leave comments about this page that are readable by all visitors then you can enter something into my Guest Book. USAF staff may be particularly interested in leaving their email/address so that other colleagues who were stationed at Wethersfield with them can get in touch. Finchingfield enters the 3rd millenium! If you'd like to give me private feedback about this page (good or bad!) then click here to send me email about it. I've searched the web for other information about Finchingfield but was unable to find anything of real interest so I will be adding more information here as and when I get the chance.